WARNING: This book will blow your mind. Matthew Santoro is a fact-filled YouTube sensation. 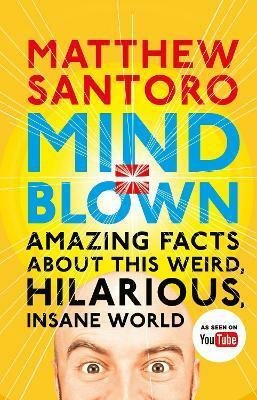 Now comes his first ever book packed full of trivia, laughs and facts that seem too mind-melting to be true. From videogame characters that were based on real people to myths you still believe about space, Santoro brings together the world's most amazing facts in mind-boggling Top Ten lists and myth-busting revelations. Did you know that it's illegal to die in the Houses of Parliament? Or that under extreme pressure peanut butter can be turned into diamonds? If you like to learn new things and laugh a little while you're at it, you won't believe what you'll discover in Mind = Blown. Matthew Santoro is a YouTube star whose videos have been viewed more than 500 million times. He is best known for his Top Ten lists of strange and surprising facts, and his popular series '50 Things to Blow Your Mind.' A former accountant, he won the 2015 Hubub #AcademySocial award, as well as the fan vote for the 2015 Shorty Awards 'YouTube Star of the Year.' He lives in Toronto, Canada.